Ah, the aniseed! Like cilantro, it has a taste you either love or hate. Absinthe, sambuca, pastis, raki are all anise-flavored spirits that inspire devotion or downright hatred. Me? I love licorice. So you know what side I fall on. Recently the mysteries of one of these aniseed derived drinks was revealed to me at Agora, the new Turkish restaurant on 17th Street NW in Dupont Circle. The charming bar manager, Ismail Uslu, was kind enough to let me sample some raki, Turkey’s official national drink. It was a fascinating experience and one I hope you’ll share. But what is raki exactly? Like ouzo and grappa, raki is produced by distilling the solid remains of fruit after it’s been pressed, commonly raisins, figs, or grapes. Then it’s flavored with aniseed. Raki can be drunk straight (called “sec”), in which case it’s clear, or diluted with cold water, which turns it milky white. Ice cubes can also be added after dilution according to personal preference. Agora stocks six raki of different styles and distillation levels so you can sample several to see which one you prefer. 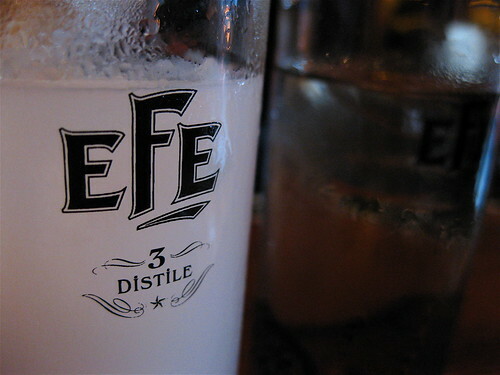 I tried Efe, which is triple-distilled from grape remains. Ismail showed me the traditional way to serve raki. Two glasses were placed on the bar, one with plain raki about a third of the way full, and the other with water. From a separate pitcher he poured chilled water into the raki which resulted in the magical transformation known in Turkey as “the lion’s milk” – turning the raki that beautiful opaque color. Then he placed a bowl of ice cubes down for me to add as I liked. No indeed. Raki is smooth, more so than ouzo, with a lovely light viscosity on the tongue. To me the licorice taste is incredibly refreshing on a hot humid day. Certainly they know a thing or two about heat in Turkey! Ismail explained that raki became very popular after the Ottoman Empire when the legends spread that the founder of modern Turkey, Ataturk, would always drink it before making decisions. Hmm… perhaps he was on to something. That sounded far too tempting, and he was highly persuasive, so I gave it a shot and tried a bit of raki balik myself with Agora’s simple grilled fish and arugula salad. And of course, he was right. 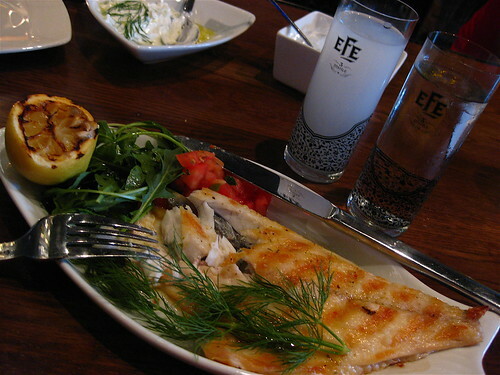 The flavor combination – the density of the white fish, the tartness of the lemon, the peppery bite of the arugula – all were delicious washed down with the anise of the raki. If I closed my eyes I could imagine myself at a seaside cafe on the Mediterranean. “Turkish people take their time to enjoy their food and their raki,” Ismail said with a smile. He’s proud to share his beloved culture with DC. It all makes sense, of course. Regional dishes like the mezze served at Agora grew up hand and hand with regional drinks like raki. To pair them together sweetens the experience of learning about a different culture, and in a deadly hot summer like we’re having, it’s worth learning how to cool down from cultures that perfected the art. So next time I’m in need of a long night of relief from the heat and looking for fun with friends, I’m convincing them to do raki balik! Agora is located at 1527 17th Street NW. Closest Metro stop: Dupont Circle (Red line). For more information call (202) 332-6767. Makes me homesick for DC. Excellent article.